It’s hard being a teen. 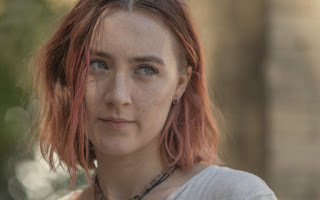 Christine ‘Lady Bird’ McPhearson (played by Saoirse Ronan) would score an A+ in that subject (and that subject alone) if only her Catholic school assessed adolescence alongside more traditional topics. Eschewing her given name for a more self-expressive ‘Lady Bird’, she is growing up on “the wrong side of the tracks” in Sacramento accompanied by a depressed economy, family, education and social life. Her Mum (Laurie Metcalf) works double shifts at the local psychiatric hospital; her dad’s firm (he’s played by Tracy Letts) is hitting the rocks. Her brother needs a job, while his live in girlfriend is perhaps the most upbeat member of the family. This is no California dream in this corner of post-9/11 America. In fact, the dream is to get out of California and find solace on the east coast. But neither her grades nor her family’s bank balance is likely to facilitate that outcome. 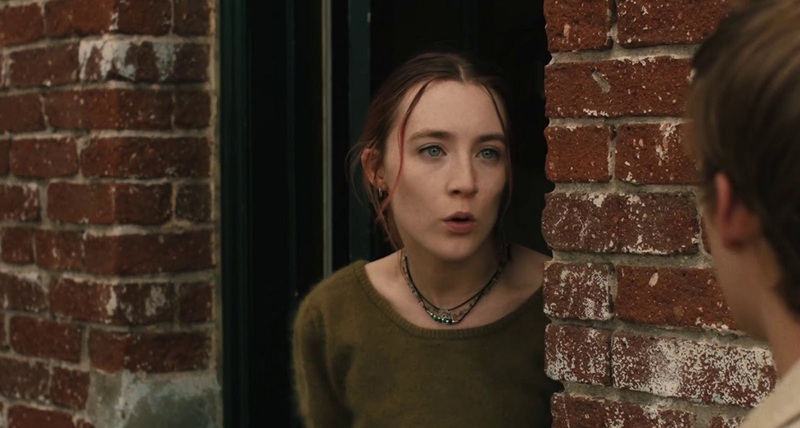 In senior year at a Catholic high school, Lady Bird finds friendship in the drama club, before flitting away to hang out with the cool kids whose affluence she admires and whose turned up noses she tolerates. And there’s quite a bit of hanging out with boys and kissing of frogs. Though while each boyfriend is enigmatic for the first few minutes, unfortunately they quickly lapse into two dimensional stereotypes rather than real, gritty people. The drama teacher Father Leviatch (Stephen McKinley) disappears unsatisfactorily from the narrative, making way for Father Walther (Bob Stephenson) who brings a totally different playbook to his dramatic direction. A few of the other characters have more interesting facets and more surprising twists in their story arcs. School principle Sister Sarah Joan is unexpected witty, while Lady Bird’s best friend Julie (Beanie Feldstein) eventually pulls a okay performance out of a meh beginning. But it’s the parents, her conspiratorial and supportive father and her always-on-her-case mother off whom she bounces most frequently. While her nagging mother shows some signs of love, it’s nearly always too little, too late. The ethic of the 94 minute long film is that if you’re not going to follow the rule, then you better learn when you’re living. It’s a film full of aspiration, longing, discovering, breaking free, and failing to cement a maternal/child bond. It’s also a film in which a child turns out to be frighteningly like their mother and in which perfunctory religious observance in school later provides solace when the chips are down. Yet the pair of them continuously fail to reach out to reassure each other and overcome their internal insecurities. Jon Brion’s woodwind score is mellow though the final descent into doom wasn’t as steep as the soundtrack suggested. As a parent of a newly teenage child, I know that car journeys offer both the chance for conversation and awkward silences. And the two car journeys that more or less bookend the film are beautifully shot and edited. 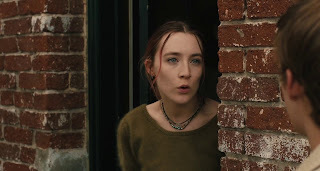 If Saoirse Ronan can be forgiven for appearing in Ed Sheeran’s Galway Girl pop video, then her performance in Lady Bird can be applauded for its representation of plainness, self-doubt, misplaced confidence, expression, and resilience. Lady Bird is no role model, but all the same, no anti-hero. I like Lady Bird, not for its profundity, its pathos or its pithy one-liners. The humour is gentle but it’s in no way as laugh out loud funny as I remember Juno. Would another couple of draft scripts have tightened up the plot and decreased the number of loose ends? Instead I warmed to it because writer and (début) director Greta Gerwig portrays an imperfect family unit with imperfect expression of feelings and imperfect life choices that challenge through pain and acceptance. It’s much closer to home than most Hollywood fare and if we needed another coming-of-age movie added to the already bulging genre, then this one is a worthy entrant given the teenage and parental angst on show. Lady Bird is being screened in Movie House Cinemas and the Queen’s Film Theatre from 23 February (with a special preview in the QFT on 21 February).